Lake Emergency Medical Services is proud of our Special Response Division and the personnel chosen to be on the teams. Each team has their own unique contribution to our response to the many needs and events the citizens of Lake County present. Members of our teams are selected from the many hard-working Paramedics and Emergency Medical Technicians (EMT) that dedicate their lives to the health and well-being of this community. Provide emergency medical services (EMS) support during special events and serve as a venue for ongoing public relations. Events include but are not limited to: parades, holiday festivals, triathlons, 5Ks and other various events involving large crowds. Due to the nature of the events and tight spaces in crowds, the bike team can make rapid access to patients and initiate medical care. All our TREK mountain bikes are equipped with emergency lighting, sirens, radio communications and the necessary emergency medical supplies to treat the variety of patients we encounter. Members of this two-person team consist of both Paramedics and Emergency Medical Technicians (EMT) capable of providing Advanced Life Support (ALS) care. Team members have completed and continue to pursue extensive classroom and hands on training in all aspects ranging from: bike maintenance, safety, patient care and crowd dynamics. The Segway Team adds another unique tool to the Lake EMS repertoire and enhances the capabilities of providing emergency medical services (EMS) at various special events. Segways provide the ability to administer patient care at crowded events as well as remote or limited access areas such as intermodal pathways and trails. All members of this team have completed didactic and practical training equipping them to handle the Segway and treat the variety of patients they may encounter. This two-person team consists of Paramedics and Emergency Medical Technicians (EMT) capable of providing advanced life support (ALS) care with the equipment carried on the Segway. Dedicated to providing rapid response to surface water rescues and ensuring the safety of swimmers or boaters at various events and locations. Personnel selected for this team have undergone a rigorous qualifying process and are required to partake in arduous training to remain a member of the team. 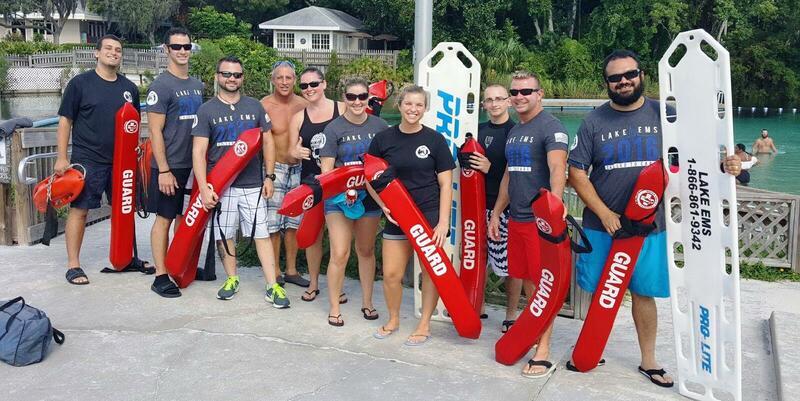 Members are comprised of both Paramedics and Emergency Medical Technicians (EMT) prepared to administer patient care upon contact while still in or on the water. The mission of the RTF team is to provide emergency medical care during active shooter and other situations involving domestic terrorism. Specifically, members of this team will respond and work closely with the Lake County Sheriff’s Department (LCSO) and their SWAT Team. Rescue of victims and patient care will be provided by team members in zones that would otherwise be considered “warm” zones; potentially while the incident is still developing or occurring. It has been proven that early rescue and patient care provides for better survivability of wounds that could be fatal if left untreated until the scene is completely secured. 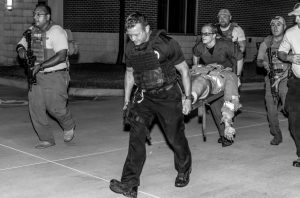 Personnel are required to maintain elite physical status and will be training alongside members of LCSO and other law enforcement officials. Lake EMS is dedicated not only to providing emergency medical services (EMS) to the citizens of Lake County, but to also reach out to our community by means other than 911 calls. This team provides public education, health awareness, disease and injury prevention as well as knowledge about and proper utilization of the EMS system. Educational opportunities will be presented through various community events and at times jointly with the Lake County Health Department. Topics at these events can include: CPR education, Stroke awareness, drowning prevention, disease prevention, bicycle safety and many more. Additionally, this team will serve as a venue to direct underinsured citizens down avenues to receive healthcare or medications.